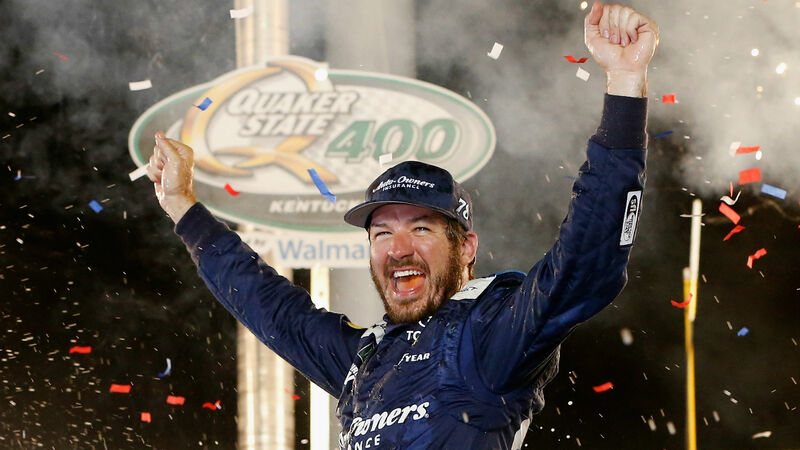 NASCAR was back for another race under the lights and Martin Truex Jr. took home the checkered flag for the second year in a row at the Quaker State 400 at Kentucky Speedway. Truex Jr. won the pole and barely relinquished the lead the rest of the night. The No. 78 driver was dominant all race long building up a lead and, in the end, winning by more than two seconds. Treux Jr. led for 174 out of the 267 laps and won all three stages to take home his fourth victory of the season and solidify his spot in the Monster Energy Cup Series point standings. The race didn’t feature nearly as much action as last week’s multiple wreck outing. Brad Keselowski was the biggest threat to Truex Jr., even after a rough pit stop early on. He led for 38 laps on the night while Kurt Busch held the lead for 45 laps. Ryan Blaney finished the race in P2 and has quietly had a solid year with six top five finishes and 10 in the top 10. Truex Jr., Kyle Busch and Kevin Harvick have dominated this season as a group and have been dubbed “The Big 3.” Combined, they’ve won 14 races this year and sit comfortably atop the leaderboard in point standings and playoff points. Sporting News has a recap with results and highlights from the Quaker State 400 at Kentucky. 10:36 — Another W for Martin Truex Jr.
10:28 — And it’s back-to-back wins in Kentucky for Martin Truex Jr.
10:25 — Five left now and barring something wild, Martin Truex will finish out front with over a two-second lead. 10:18 — Twenty laps to go and Martin Truex is inching closer to defending his trophy. Ryan Blaney and Brad Keselowski behind him are trying to make sure that doesn’t happen. 10:08 — Not even a race can stop them from getting the grass watered at Kentucky Speedway. 10:06 — Martin Truex grabs the lead back with 44 to go. 10:01 — Back to green and they’ve got 53 laps to go now. A near wreck nearly takes out Aric Almirola and Daniel Suarez but they hang tight. 9:54 — Kurt Busch elects to take just two tires so he gains four spots and leads the way off pit road during this caution. 9:51 — Martin Truex is back out front but the caution flag is out for J.J. Yeley whose car is smoking and has come to a stop. 9:37 — Kyle Busch reporting a vibration but he’ll stay out as long as he can. Brad Keselowski still out front with Martin Truex playing catch up. 9:33 — Things are getting a little more interesting in Kentucky. 9:28 — What a job on the latest pit stop from Brad Keselowski. 9:21 — Martin Truex goes two for two with stage wins in Kentucky tonight. He did the same last year and made it three for three and a win. STAGE 2 WINNER: MTJ does it again! 9:16 — Ten more left in the stage and behind Truex, it’s Kyle Busch, Ryan Blaney and Kevin Harvick. 9:11 — Just 20 laps to go in Stage 2 and Martin Truex has a comfortable lead. 8:58 — Green again and there a three-wide battle for the top spot. Martin Truex comes out in the lead. 8:51 — Caution out for Alex Bowman who takes some heavy damage to the front right after a blown tire and a hit with the wall. 8:49 — Martin Truex is back out front on lap 98. And he’s built himself almost a three second lead. 8:41 — Kyle Larson has climbed his way all the way up to P7. Impressive stuff from the No. 42 car. 8:40 — It’s green again with another 80 laps in this stage. 8:37 — It’s Kurt Busch who wins the race off pit road. Joey Logano stayed out though so he will lead on the restart of Stage 2. 8:30 — And it’s Martin Truex Jr. taking home Stage 1 in Kentucky. STAGE 1 WINNER: MTJ ? 8:27 — Less than 10 to go in Kentucky and after pit stop cycles it’s the Big 3 up front: Martin Truex Jr., Kevin Harvick and Kyle Busch. 8:20 — With 20 laps to go it’s Kurt Busch out front with Joey Logano and Alex Bowman behind him. Busch pits then on lap 61. 8:09 — Brad Keselowski gets nailed with a speeding penalty. Tough break for the No. 2 car who was riding with the leaders early on. 8:07 — D rivers start heading down pit road including Denny Hamlin, Jimmie Johnson and Clint Bowyer. 8:02 — Some trouble for Ricky Stenhouse Jr. today. He’s forced to pit road twice for some vibration issues. 7:53 — Nothing wild through 10 laps but Erik Jones has fallen back to P7 and Kyle Larson has crept up to P24. 7:48 — And they are underway in Kentucky. 7:45 — Kyle Larson forced to start from the rear for missing driver intros. Costly little absence there. 7:40 — The engines have been fired. Almost time to get things rolling. 7 p.m. — Race time is getting closer in Kentucky.